Do you get too much e-mail? Are you overloaded with text messages? Will another cc’d message drive you over the edge? Will one more spam message that snuck by your filter force you to lob your BlackBerry into orbit? Yes, the number e-mails can be overwhelming. I know it is a problem for me. I have a couple of e-mail addresses forwarded to my CrackBerry and I get way more e-mails than I want. In addition to ‘ringxiety’ and being addicted to my Berry, I also have the anxiety that I will miss an important e-mail while mass deleting a bunch of crap. And I am not alone. A survey conducted last year found that half of all senior executives said they receive too many e-mails and text messages. It is interesting to note that most of them also felt they sent the just right amount of e-mail. 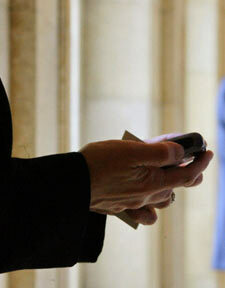 In another survey, 75 percent of Blackberry users said they receive too much e-mail. Some executives spend a significant amount of their workday dealing with e-mail and many are of the opinion that dealing with it negatively affects their productivity. Some report spending as much as four hours a day reading and responding to e-mails. Utilize management tools in e-mail programs such as Microsoft Outlook that can be used to organize e-mails. Another method of managing e-mail is called the “Triage” approach. In this method you only deal with message once. All messages are read and then either deleted or responded to immediately. You can also organize e-mails deadline or subject. Practice effective time management by scheduling specific times to deal with e-mail. Either turn off your BlackBerry between these times or put it out of site and turn vibration off. Two of the worst sources for extraneous e-mail are external news sources and professional subscriptions, so cut down on the number of feeds you subscribe to. Of course, one of the main complaints about BlackBerries is the increased expectation that e-mails need instant responses. One way of dealing with this is for companies to set policies for e-mail usage. Some companies have instituted training courses that emphasize the need for e-mailers to respect the productively needs and time management requirements of others. Use clear subject lines, and indicate if the message is for action now or FYI. Eliminate distribution lists of more than five names. Cease the use of the cc, bcc, forwarding and "reply to all" functions. For short messages, put all the information in the subject line, ending with "EOM" (end of message. For non-urgent information, consider bundling information into an informal newsletter. The more e-mail you send, the more you are going to receive. Try using the phone or actually walk to the colleague's office, it might be faster.